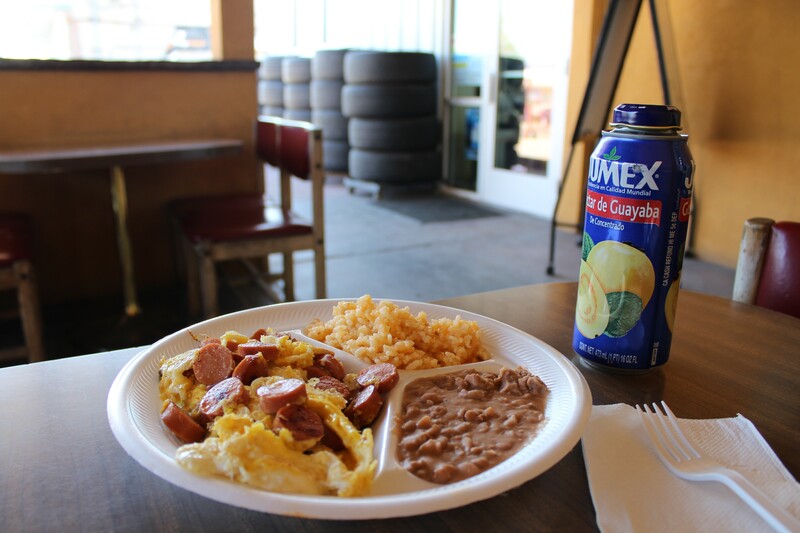 Before my maiden voyage to Victor's Tires & Restaurant (1406 S. 700 West, 801-978-9595), I knew about the place by reputation—the Mexican restaurant adjoining a tire shop is highly praised throughout the City Weekly bullpen, earning a 2017 Best of Utah award. What was once a simple operation serving chips and salsa to those in need of some new rubber has become a Salt Lake institution, and it's a concept I wish more mechanic shops would catch on to. There's not much I hate more than waiting for my car to be serviced, and having a family-owned spot that serves up some fantastic tamales would definitely improve the experience. Admittedly, I wasn't quite sure what to expect when I pulled up to Victor's. Despite the signage saying there was a restaurant within, instinct and habit told me I was here to get my tires rotated. Finally, I convinced myself I was, in fact, here for Mexican food, and stepped inside. Surprisingly, the merger of two seemingly disparate business entities was very organic once I walked up to the cashier. The tire shop is immediately to the left, and the restaurant is housed in its own little hacienda to the right. A gigantic, colorful menu hangs above the cash register, right next to a list of Victor's signature tire services, which reminds me—it's about time to get the ol' tire pressure checked. After ordering some huevos con salchichas ($7.99)—or con weenie if you're in the know—a chicken and green salsa tamal plus a pork and red salsa one ($1.99 each), I took my number and settled in the cozy restaurant area. As my inaugural visit took place during the 2018 World Cup, the place was reasonably packed with hungry futbol enthusiasts watching the game while they ate. After hearing CW Editor Enrique Limón wax nostalgic about the huevos, which were a childhood favorite of his, I was looking forward to giving it a try. It's a dish that definitely hits a lot of my breakfast bases—hot scrambled eggs tossed with some salty processed meat will always be the breakfast of champions—but the addition of rice, beans and two housemade tortillas brought the whole enterprise into breakfast burrito territory, which is where I hope to retire one day. Victor's tamales are quite buzzworthy—I've heard many fans of the restaurant sing its praises, which are rightfully earned. They come in several varieties, even veering into dessert territory with strawberry or pineapple-filled options. I've grown quite fond of the pork with salsa—the braised pork is drenched in an angry-looking red salsa that packs just the right balance of flavor and heat. The chicken one with green salsa was also tasty, but I felt like its red counterpart packed more of the punch I was looking for. Perhaps the secret to these tamales comes from the masa that surrounds each in a loving embrace. It's as tender as a kiss on the cheek and full of comforting flavor. For sandwich aficionados who have yet to experience a traditional Mexican torta, you need to get your asses over to Victor's, pronto. Each dense, meat-filled torta is a meal unto itself. I spied a torta Cubana ($8.99) at the top of the menu, and leapt at the chance to add another interpretation of a Cubano sandwich to my repertoire. Victor's torta adheres to the traditional foundation of a Cubano—the shredded carnitas are spread across a layer of sliced ham and melted Swiss cheese—but they've made some welcome additions. Instead of a sliced pickle, Victor's piles its Cuban with slices of pickled jalapeño, along with lettuce, tomato, avocado and a healthy dose of crema, which adds an extra level of tang. All in all, this is a damned fine sandwich, and it's time to start doing some serious research into the rest of Victor's tortas. If the thought of eating at a restaurant attached to a tire shop makes you a little apprehensive, please take a moment to dispel that nonsense right now. Not only will I be inventing reasons for the mechanics at Victor's to inspect my tires just to secure a plate of tamales while I wait, but I found the whole place to be warm and inviting even if my wheels are in good shape. My experience at Victor's also happened to coincide with the tragic displays of familial separation at the U.S. southern border, which made me pause and appreciate how grateful I am that we have restaurants and other businesses that were built by immigrants. So many of the memorable experiences I've had at places like Victor's wouldn't be possible without the world's many different people choosing to set up shop in my neck of the woods. There are a lot of different ways to support those who have come to share their food, culture and perspective with us, but one of the easiest is to simply eat at a restaurant owned and operated by immigrants or refugees. Show them we love them for choosing to share their food with us. Food reaches across borders, creates community and fosters perspective, and I'll always be grateful for the lessons I've picked up every time I try something from a different country.